HTC has launched many phones in Desire range and mostly Desire series indicates for mid-range series, but Desire Eye is not cheap in price. 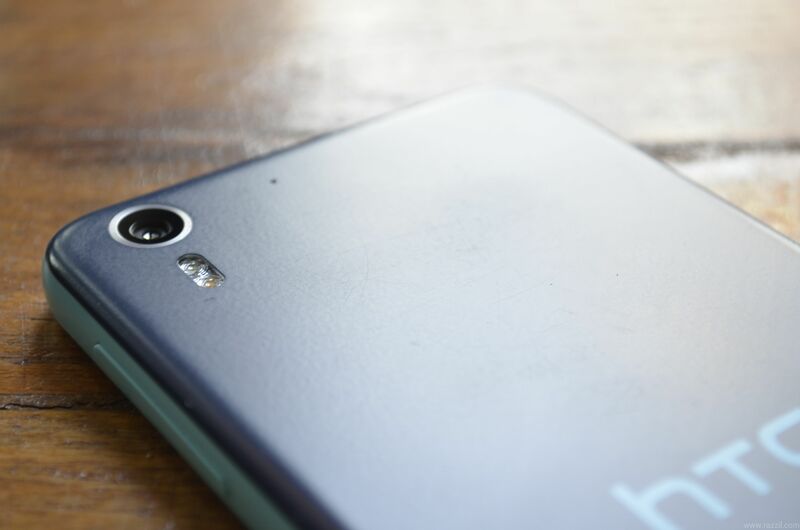 I’m using HTC Desire Eye for sometimes and here is my HTC Desire Eye review based on the usage. Light in Weight, Plastic body! HTC is King when it comes to Smartphone Design, no matter whether the chassis is made up of Metal or Plastic. HTC Desire Eye has a plastic body. The Desire Eye features two tone color body, with a light blue strip on trim and dark blue color on back. I like this Ice Cream Sandwich style and this two-tone colors make the phone looks different than any other phone. The phone is 8.5 mm and very light in weight around 154g. 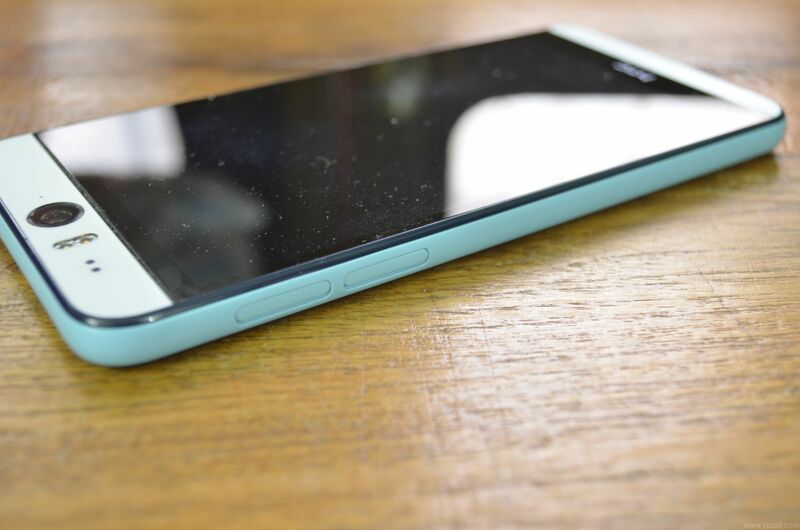 The phone looks slightly big because of 5.2-inch Full HD 1080p Display. 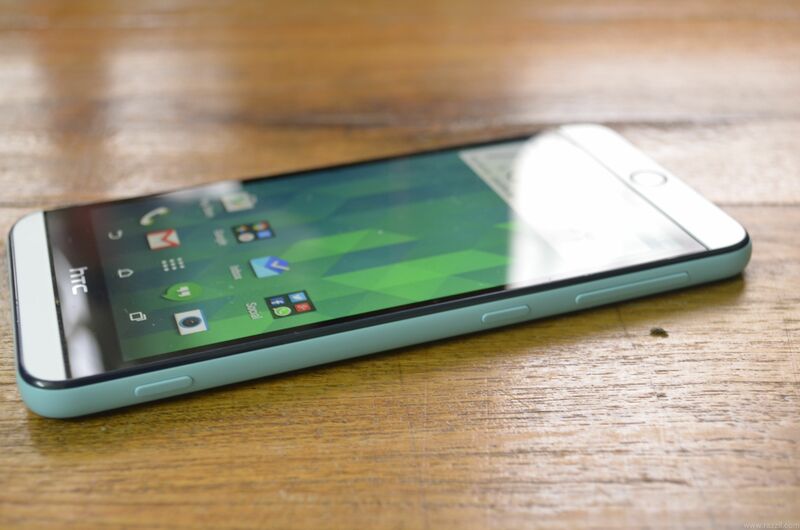 There is no curve on the back like we’ve seen in HTC One M8. 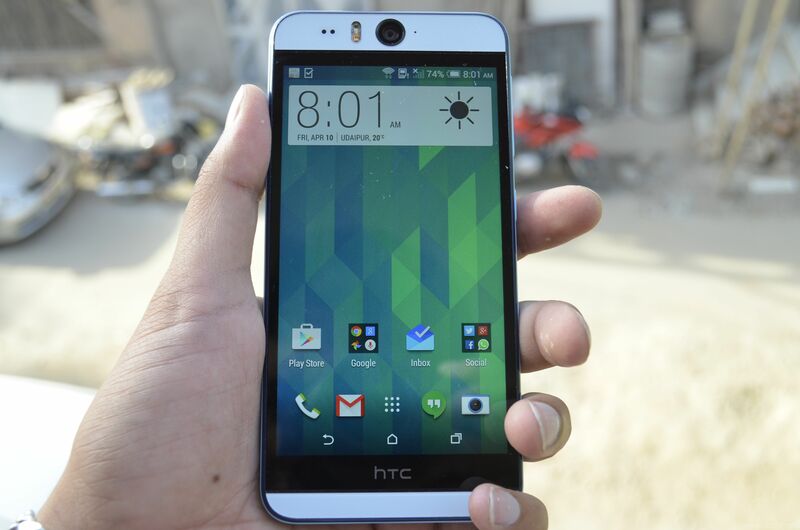 Just flat with HTC logo in the middle and 13MP shooter on top left. The company also nicely hides the Dual speaker in the front and this helps him to achieve IPX7 rating, which means the phone is protected with water. The phone has two nano-SIM slots and a MicroSD card slot. The phone comes with Full HD IPS Display with resolution of 1920 x 1080 pixels and 424 ppi. The screen is sharp, clear, good color production and bright enough to see in direct sunlight. Powerful processor capable to run any games. The Phone doesn’t heat up in most conditions. 16GB Internal Memory & 2GB of RAM. Under the hood, the phone is powered by 2.3GHz Qualcomm Snapdragon 800 processor mated with 2GB of RAM and Adreno 330 GPU. The phone has enough firepower to run any games or execute any tasks. The processing power is same as you found in M8 or Galaxy S5. 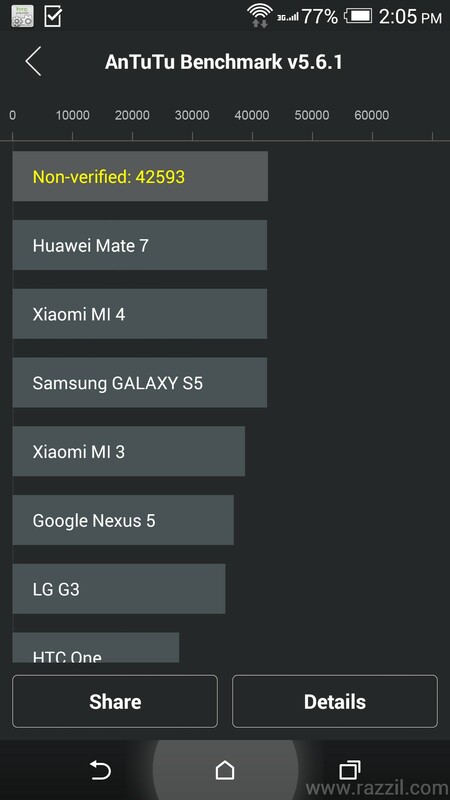 On AnTuTu test, my device scored 42593 which is very close to M8, S5 & G3. Crisp & Clear image from both front & rear camera. Physical camera button, but I bet you won’t use it much. HTC Desire Eye designed for selfie lover, the phone has a 13MP camera on both front and rear with dual-tone flash and BSI sensor. The rear 13MP camera comes with f/2.0, 28mm lens, wide angle and Full HD video recording. The rear camera did an awesome job with well-saturated color and very less noise. In my opinion, the rear camera performs better than HTC One M8 Eye and HTC One E8. The Auto HDR option is still missing. The phone also has physical camera button, when you press the button half-way it’ll fix the focus and completing the action will capture the photo. But here is the catch, the button is not responsive like the camera button. It’s better you stay away from shutter button and use the camera app button. The low light result is ok, not as good as HTC One M8 Ultrapixel. Both front-rear camera to perform really well in most of the conditions. The front camera comes with 13MP auto-focus, BSI sensor, f/2.2, wide-angle lens, dual LED flash and Full HD video recording. The front camera is brilliant if you compare with other phone, it has HDR capability and with the help of flash you can even take good selfie in low light condition. 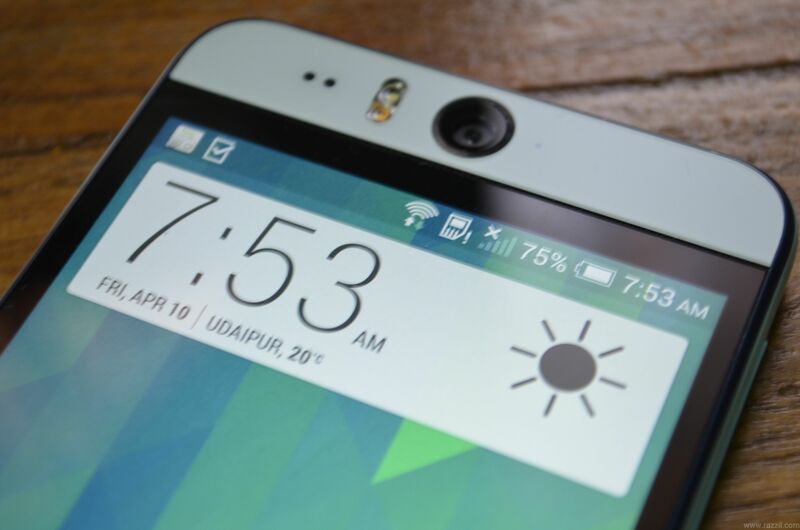 The HTC Desire Eye is powered by Android 4.4.4 KitKat with HTC Sense 6.0 UI on top. 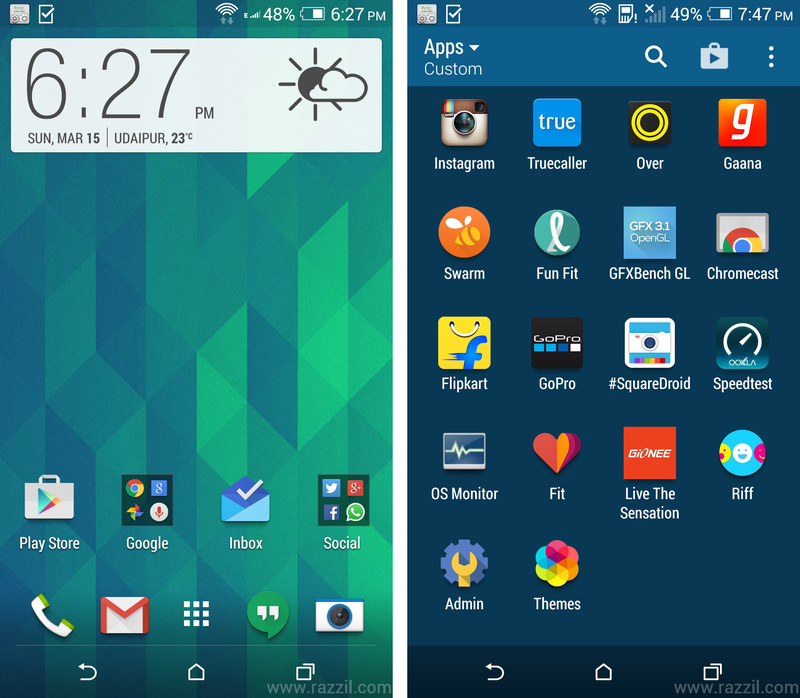 The phone is due to get Android 5.0 Lollipop and Sense 7.0 update. I believe that HTC Sense is the best skin on all Smartphone skins. The Sense UI is elegant, responsive, full of features, BlinkFeed, theme customization from theme store and Extreme power saving mode. The most of the important thing in Sense UI is that, they break the entire UI into apps and uploaded to Google Play. 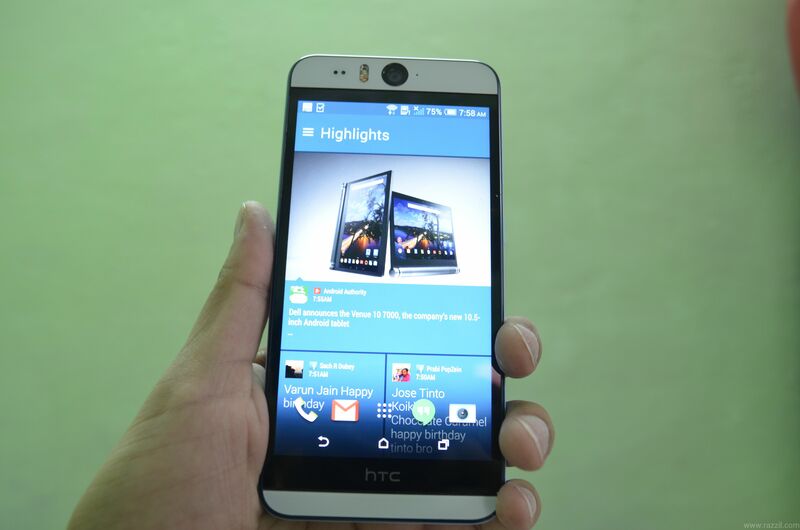 By this, HTC continuously improves the overall experience without pushing the OTA. HTC improves the BlinkFeed, now it’s no more content aggregator. BlinkFeed is now more intelligent in Sense 6. BlinkFeed will bring restaurant recommendations from Foursquare and I also noticed that when I was searching restaurant on Foursquare app, at that time BlinkFeed automatically bring nearby restaurant list. Good Battery Life even on 3G. The HTC Desire Eye has a 2400 mAh battery which sounds a little lower about Desire Eye size, but in reality it performs really well, thanks to Snapdragon processor and Sense UI which is very well optimized. The phone will take you to a full day with a single charge and if you consumption is lower then you’ll get a chance to see the sunrise. 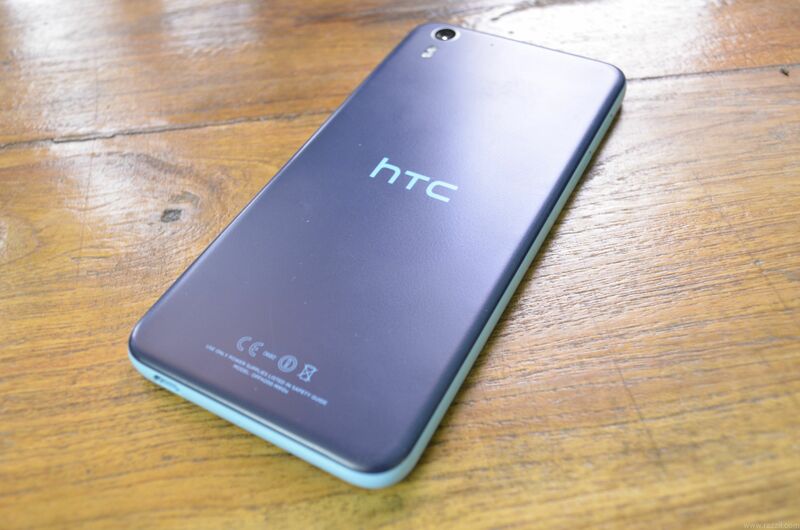 The HTC Desire Eye is the best phone in Desire series and best when you compare with E8. The phone has everything from elegant design to fantastic front and rear camera.